In the next couple of hours I will be posting a number of updates about upcoming projects. 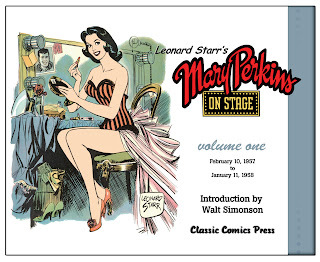 First up: The reprinting of Leonard Starr's Mary Perkins On Stage Volume 1. Note that for this special 3rd Printing of On Stage Volume 1 there will be a slightly different cover and will be priced at 21.95. For those of you who have asked about a special price, due to the fact you already own a copy of the first or second printing I will be posting a special on the Classic Comics Press website in the next couple of days. Why would someone need another copy of vol.1 if you already have vol.1? Does it have content that wasn't in the original vol.1? Volume 1 has been out of print for a couple of years now so 1) people are still discovering the series and asking where they can get it, 2) I've managed to replace some of the bad artwork and there was a problem with the size ratio of the strips so they were slightly off. The book is being totally redone for that reason. To distinguish between the early printings and this new/updated printed I have changed the color bars and volume one line. A bigger reason is that there are those out there who are selling on Amazon for upwards of 150.00 - which is sorta sad. Since I've posted the listing for the reprint I've sold quite a few copies which is always a good sign.